In 2006, the 42-year-old Hacken Lee married former Miss Hong Kong, Emily Lo Suk Yee. Their first son, Ryan, was born two years ago. In December 2009, Hacken announced that Emily was pregnant with their second child. On March 26th, Emily gave birth to her second child, Rex, a seven pound baby via C-section. The delivery was scheduled in advance by Obstetrician, Leung Suk Tak, who also delivered Hacken’s first son, Ryan via C-section. The delivery went smoothly and Emily left the hospital on March 31st via a secret passage, successfully bypassing the media’s attention. Although the birth of Rex was a joyous event, Hacken did not publicly announce it to the media. When Ryan was born, Hacken excitedly anticipated the birth and told many of his friends about it. 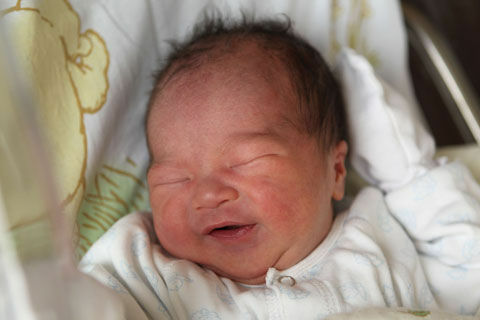 As a result, the media was aware of Ryan’s impending birth and Hacken felt obligated to distribute photos of his first newborn son. Allegedly Hacken chose to remain quiet , Hacken did not want to handle Ryan’s birth in such a public manner at the time. Hacken chose to remain quiet about Rex’s birth. Rex’s pediatrician will be Pang Yeuk Shue, who is also the doctor for Cecilia Cheung Pak Chi’s son, Lucas. Hacken’s music company, Universal Music, is currently in a royalty dispute with TVB. As a result, Hacken’s exposure on TVB has decreased, reducing his income earning opportunities as well. In order to earn more money for his expanding family, there are rumors that Hacken may host I-Cable’s broadcast of the World Cup this year. Jayne: Congratulations to Hacken and Emily Lo. What a cute baby with pinchable cheeks! I’m a huge fan of Hacken Lee. Congrats to Hacken and Emily with their second addition to the Lee family! wooohoooooo!! Yay for Hacken, Emily and Ryan!